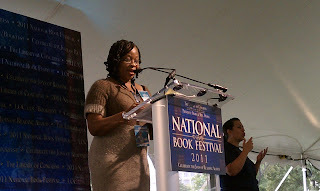 More than 200,000 bibliophiles converged on The National Mall this past weekend, and you can bet I was among them. My first stop was Brian Selznick's book signing, where kids ignored the mosquitoes and rain-soaked ground to delve into the pages of Wonderstruck while waiting to get their copies signed. I got there half an hour early and was still about the 200th person in line. Good thing book lovers love to talk books, so I found some great company in the two teens standing in front of me. We talked Sign Language (their father is deaf) and how the small details in Selznick's art makes it so unique. I am now the proud owner of a signed copy of The Invention of Hugo Cabret. 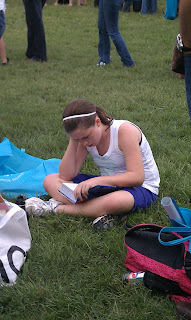 I then found a spot in the teen tent where I spent the rest of the afternoon, basking in the energy of teens who love to read. 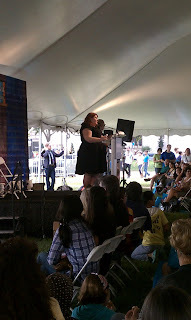 I only caught the Q&A section of Cassandra Clare's speech, but she had me in stitches the entire time. Apparently she built her writing chops writing Lord of the Rings fan fiction told in the style of Bridget Jones. Priceless. "Usually characters are a composite of people I know, people in movies and characters in books I've read, and by the end, they're so mashed up the people they're originally based on don't recognize them." 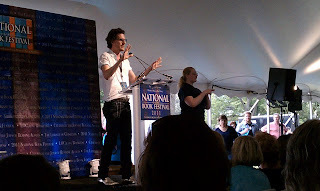 Brian Selznick took the stage next. While he talked a lot about seeing his book come to life thanks to the amazing Martin Scorsese, he mostly talked about how images can give depth to a story. I loved listening to him speak about perspective and connection—how everyone sees the world through different eyes. "People really like to help you if you ask, especially if they're an expert in something really specific that no one else asks them about." The ever-enthusiastic Rita Williams-Garcia closed out the day by treating us to an interpretive dance of her presentation, which consisted mainly of her jumping up and down in excitement and doing a hysterical impression of how her curvaceous mother used to "carry the jazz band with her" wherever she walked. She gave the most incredible talk about the importance of finding and building your own character. "My friends and people I've met inspire my characters, but it was my family that built my character... It all boils down to building character, to showing character." I honestly didn't want the day to end. Good thing I still had the next day to listen to the inspiring words of some of my favorite authors.